All transactions are safe and secure with a reliable history in online purchasing behind each of our associates. 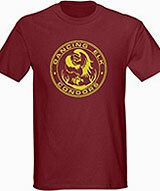 Buy the Dancing Elk Condors Juno t-shirt to own Juno clothing and merchandise. Dancing Elk is the fictional high school that the characters attend in the Juno movie. The Dancing Elk Condors logo on this Juno tee represents the school's athletic teams, with the condor being the school mascot. Paulie Bleeker can be seen wearing a Dancing Elk Condors t-shirt and sweatshirt in the movie. This design is also available on men's apparel items. Browse through to see a wide selection of styles and colors, including Juno Dancing Elk Condors hoodies, tank tops, and ringer Ts. In addition to the Dancing Elk Condors Juno tee above, browse the Juno Clothing Gallery for more apparel like men's and women's clothes, kids shirts or hoodies.